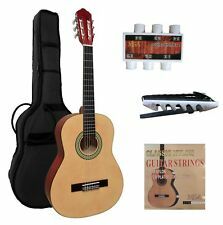 Beginners Acoustic Guitar with Guitar Case, Strap, Tuner and Extra String Set. Looking to be the next Eric Clapton?. Why not start off with this Beginners Acoustic Guitar?. This set includes a case, a strap, a tuner, and an extra set of strings. Guitar has a perfectly straight hard maple neck and Low easy play action. Excellent tonal range. Verstärker (Guitar Amplifier) GW25 -Edel Elektrogitarre - E-Gitarre im 45 Watt Set mit Stimmgerät von Vision / MSA. - 1x Verstärker GW25. - 3-Wege Schalter. - 6 Stahlsaiten. - 1x Satz Ersatzsaiten (Stahlsaiten). Original box. Guitar made from all the best quality hardwood timbers real heavy! It weighs a full 3.6 kg. Guitar fully checked out neck is straight with low easy play action. All electrics work perfect. 24 fret lead guitar for the virtuoso! The guitar is checked out and plays and tunes perfect with straightneck and very low easy play action. Guitar is excellent quality by Wilkinson. Made from all the best quality heavy hardwood timbers. Weighs a full 4.2 kg! Guitar has been plugged in and all the electrics work perfectly. The neck is perfectly straight and the action is low and easy to play. Verstärker (Guitar Amplifier) GW15 - 1x Verstärker GW15. -Elektrogitarre - E-Gitarre im SET von Vision / MSA. - 5-Wege Schalter. - 6 Stahlsaiten. - 1x Satz Ersatzsaiten (Stahlsaiten). - Endknopf für Gurtbefestigung. Verstärker (Guitar Amplifier) GW15 - 1x Verstärker GW15. - Endknopf für Gurtbefestigung. - 6 Stahlsaiten. -Elektrogitarre - E-Gitarre im SET von Vision / MSA. - 5-Wege Schalter. - 1x Satz Ersatzsaiten (Stahlsaiten). 1x Gigbag Gitarrentasche (10mm Polsterung, Notenfach, Rucksackgarnitur, Panzerreißverschluss). Endknopf für Gurtbefestigung. In verschieden Farben/Modellen von MSA erhältlich ! 4 Stahlsaiten. -Top Marken Long ScaleElektrobässe im Set mit Gigbag-Tasche von Vision. Verstärker (Guitar Amplifier) GW15 - 1x Verstärker GW15. -Elektrogitarre - E-Gitarre im SET von Vision / MSA. In verschieden Farben/Modellen von MSA erhältlich ! - 5-Wege Schalter. - 6 Stahlsaiten. Guitar is manufactured from all the best top quality heavy M/hog hardwood and weighs 3.2 kg. And it is comparable to a Gibson USA guitar. The SG is a very popular guitar with famous guitarist Frank Zappa and Eric Clapton. Constructed with a hardwood body and fingerboard with truss rod neck. Available finishes include Pop Princess Pink, Blueblast Sparkle Blue, Jet Black and Gold Rush. J. Reynolds JRPKLPGD. Acoustic Electric Guitars. Single Cutaway Les Paul Body Style. Electric Guitars. A broken string is not considered to be a "defective" product and/or "not as advertised". 4 Stahlsaiten. Endknopf für Gurtbefestigung. -Top Marken Long ScaleElektrobass im 70 WATT Set von Vision. Griffbrett: dunkles Holz, Palisander-Optik. E-Bass der Modellreihe J.B. Verstärker (Bass Amplifier) B40. · 6 Stahlsaiten. Headless E-Gitarre von Cherrystone. · E-Gitarre wie beschrieben. · Ahorn Hals. Gitarrenkabel und Zubehör. · Griffbreite am 1. Bund: 43 mm·. Fender Guitar Starter Kit, Red Color. Farbe: dunkelblau-transparent. -Elektrogitarre - E-Gitarre im 45 Watt Set von Vision / MSA. - 5-Wege Schalter. - 6 Stahlsaiten. - Endknopf für Gurtbefestigung. - 1x Satz Ersatzsaiten (Stahlsaiten). E-Gitarre der Modellreihe S.T. Fender Squire guitar. The guitar is heavy and weighs 3.2 kg. And is a superb guitar. There is no fret wear. But there is dings and scuffs and marks to the body. The guitar has been plugged in and it sounds great and plays great. Full Scale Black Electric Guitar with Maple Neck. Guitar Amp with Headphone Jack & Overdrive (distortion). Humbucker Pickup For Rock Sound. Verbindung Hals/Korpus zusätzlich geleimt. Korpus: Erle massiv. Made from all the best quality heavy hardwood timbers weighing a full 4.4 kg! Guitar has a beautiful straightneck and very low easy play action. Real good looking guitar. Depending on which country you live in. Guitar Bridges. String Guides. Acoustic Guitar Parts. Guitar Accessories. Piano and Keyboard. Strap Buttons & Strap Locks. Guitar Features String Winder. The left handed TL model by Benson boasts the iconic single cut-a-way body with 21 Fret bolt-on Maple neck and fret board. With it's slim neck and comfortable body, probably makes this the worlds easiest guitar to play. Early Jackson Charvel. Hooked up to amp worked very well. Not sure of model. I believe to be maybe an. Verstärker (Guitar Amplifier) GW25 - 1x Verstärker GW25. -Endknopf für Gurtbefestigung. -6 Stahlsaiten. -3-Wege Schalter. - 1x Gitarrengurt. -Griffbrett: dunkles Holz, Palisander-Optik. - 1x E-Gitarre. Available finishes include Pop Princess Pink, Blueblast Sparkle Blue, Jet Black and Gold Rush. J. Reynolds JRPKLPBK. Acoustic Electric Guitars. Single Cutaway Les Paul Body Style. Electric Guitars. A broken string is not considered to be a "defective" product and/or "not as advertised". Acoustic Guitars. Acoustic Electric Guitars. A broken string is not considered to be a "defective" product and/or "not as advertised". Series: Dirty 30's Series 7. Bridge Shape: Straight. 100% US Owned. 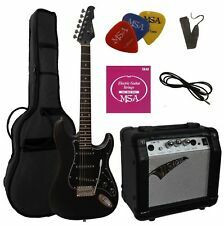 Best Choice Products Electric Guitar set is the ultimate kit for musicians of all levels. Kids, teens, and adults can learn and create new music with this complete kit! Set includes a 39 in electric guitar, a 10W amp, gig bag, strings, and a guitar strap. Best Choice Products 30in Kids Electric Guitar Beginner Starter Kit w/ 5W Amplifier, Strap, Case, Strings, Picks - Blue. BCP SKU: SKY4456. Get ready to rock! This kid's electric guitar set has everything little rockstars need to jam out in style and foster a growing passion for music. 4-Saiter E-Bass. - Korpus: Pappel. - Hals: TMB4 Ahorn. - Griffbrett: Gebackenes Jatoba mit weißen Griffbretteinlagen. - Equalizer: Ibanez Custom Electronics 2-Band EQ. Beginner's electric guitar "Starmaker", made in the style of the most famous electric guitar known. Great Value and a Good Player. This is a great beginner's electric guitar at a very sensible price as I just want it out of the way. Made from all the Best top quality hardwoods that money can buy weighing 3.8 kg! Excellent price excellent deal. Guitar as perfect straight neck and low easy play action. Plays like a dream and all the electrics work perfect. Top Marken Elektrogitarre: E-Gitarre in Dunkelrot-Transparent von Vision. -1x Elektrogitarre ST5 dunkelrot-transparent. - Endknopf für Gurtbefestigung. - 1x Zubehörkabel (Klinke 6.3. beidseitig). - 5-Wege Schalter. Hals: Ahorn "GRX". - Hardwarefarbe: Chrom. Außerdem im Paket enthalten - Griffbrett: Palisander. - Ibanez 10 Watt Verstärker. It also features a smooth-playing "C"-shaped neck and a lightweight, comfortable body. We also included a free 3-month subscription to Fender Play®—the easiest way to learn bass. In verschieden Farben/Modellen von MSA erhältlich ! 4 Stahlsaiten. Farbe: sunburst (Farbanteile: Natur, schwarz, rot, braun). Endknopf für Gurtbefestigung. -Top Marken Long ScaleElektrobass im 40 WATT Set von Vision. Weiteres Zubehör E-Gitarre Squier Strat SSS. Amp Fender Frontman 10G. - Kabel, Tragegurt und Plektren. - 1 x 6" Fender Special Design Lautsprecher. - Eingang für CD-/MP3-Player. - 2-Band EQ. Hals (Ahorn, geschraubt). in der Trendfarbe: natur-transparent (sichtbare Maserung)! In verschieden Farben/Modellen von MSA erhältlich ! Griffbrett: dunkles Holz, Palisander-Optik. 4 Stahlsaiten. The V50 natural-finish acoustic guitar features a spruce top for fantastic tone. Sheet Music. Weighs 4 1/2 lbs. I really don’t know what type of guitar this is but it is in great shape. Designed by the famous Trevor Wilkinson Who used to work alongside Leo Fender in California many years ago. Hence the excellent quality of all of his guitars and guitar parts! And of course this one. Endknopf für Gurtbefestigung. klassische Farbkombination einer Elektro-Gitarre passend für jeden Auftritt ! - 1x Zubehörkabel (Klinke 6.3. beidseitig). - 3-Wege Schalter. -Top Marken Elektrogitarre im Set mit Tasche: In verschiedenen Farben von Vision erhältlich. Der Bausatz für Ihre eigene Gitarre. · Bausatz wie beschrieben. · 6 Saiten. Eine Bauanleitung liegt nicht bei. Beispielfotos einer fertigen Gitarre · Decke, Boden und Zargen aus Ahorn. · Griffbreite am 1. Guitar Player Bundle - OVER 20 ITEMS! - Direct Box, Cable, Stand and More!